At the American Library Association’s 2007 conference, Alice L. Hagemeyer received Honorary Membership. The ALA’s highest honor, this is conferred in recognition of outstanding contributions of lasting importance to libraries and librarianship. Appropriately, Hagemeyer received the honor around the 50th anniversary of the beginning of her distinguished career as a professional librarian. Hagemeyer’s career has focused on improving library services to the Deaf community, by encouraging deaf people to make better use of public-library resources, and enhancing awareness of Deaf history, language, and culture in the library community. A mentor and exemplar, she has inspired several other deaf people to choose library careers. A native of Nebraska, Alice Lougee attended the rigidly oral Nebraska School for the Deaf, where she learned sign language from older students and adults. She didn’t come from a library-oriented family, and library services at NSD were minimal—occasional visits from a bookmobile, but no librarian and no guidance from teachers or staff in helping students make optimum use of public-library resources. She married her Gallaudet classmate Ted Hagemeyer, alumnus of the Indiana School for the Deaf, in 1958; they have two grown children, David and Noreen. For 34 years (1957-1991), she worked for the District of Columbia Public Library (DCPL), becoming its first full-time “Librarian for the Deaf Community” in 1976, the year she joined the ALA. At DCPL, she was determined to change both the public’s lack of awareness about Deaf issues and Deaf people’s traditional lack of enthusiasm for libraries, noting that the ASL sign for public library isn’t city library but hearing library. 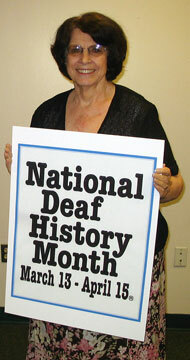 In December 1974, she launched Deaf Awareness Week at the DCPL, featuring talks by Deaf presenters. (Now called Deaf Heritage Week, it’s celebrated with a variety of cultural programs at libraries across the nation.) When the ALA established a deaf unit, Hagemeyer was actively involved in its Deaf-community initiatives. In recognition of her leadership, Hagemeyer received numerous honors, including NAD’s President’s Award in 1980. In 1979, she created The Red Notebook for the Martin Luther King Memorial Library, the DCPL’s main facility, as a first-stop resource for unbiased information for and about members of the Deaf community. This was a looseleaf binder with fact sheets, library reprints, and other useful information that could be rearranged and replaced as updates were issued. Other libraries wanted copies, which were sold by the NAD. In 2001, The Red Notebook went online (www.folda.net), with a global focus and a new subtitle, “Deaf Awareness begins @ your library.” Input is welcome from librarians, workers, paraprofessionals, users, and friends. In 1986, Hagemeyer co-founded Friends of Libraries for Deaf Action (FOLDA), continuing her activism. FOLDA-USA became an official NAD section in 1994.